I hope you are enjoying the fall season so far. I sure am. The cooler temps, pumpkin spice everything + the changing leaves are why it's my favorite time of year. I think it's given me an extra push to finally tackle some of the DIY projects I've had on my list forever. Especially a fall wreath for our front door. I saw this idea on Pinterest + it immediately appealed to me for two reasons. One, I already had everything on hand and two, I liked the rustic look of it. Here's how you can make your own. Start by wrapping the twine around the cardboard circle. I suggest using a thicker + more natural twine than what's pictured. I didn't have any brown twine so I just used what I had on hand. Oh and make sure to wrap the ENTIRE circle. I didn't have enough to cover mine completely. This is where my frugality caused my wreath to suffer. Next, trace small circles onto your felt for the flowers. (I just used an old CD). You can make as many flowers as you'd like + you can also make them different sizes. Just cut bigger circles for bigger flowers and vice versa. When you're finished, cut your circles into spirals as shown below. 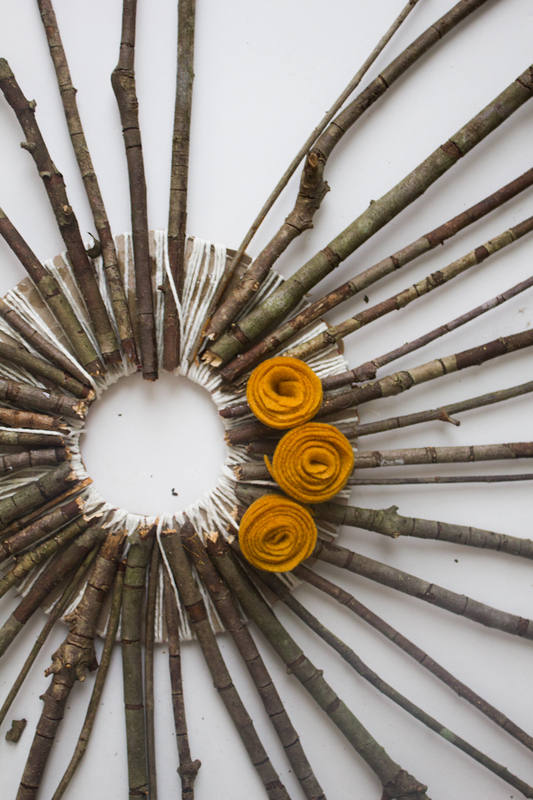 Using the industrial glue or hot glue gun, glue each branch (in no particular order) onto your cardboard/twine circle. My branches didn't seem to want to stick but I just piled on the glue and then put my husband's heavy toolbox on top and let it dry overnight. Then glue on your flowers and you're done! For it being a completely free project, I'm pretty happy with the way it turned out. What DIY project are you hoping to tackle next? So this DIY project is incredibly simple that I'm kind of embarrassed to be sharing it. I'm pretty sure anyone could have come up with this idea on their own but whatever. Ok, let's get real. Mousepads are ugly. I've never seen one and thought "That is an adorable mousepad!" Has anyone ever thought that? Maybe. Anyways, our mousepad needed a major makeover. Look at how disgusting it was (pictured below) - Gross, right? I have an insane amount of scrapbook paper (It's an addiction, really) and thought that it would be perfect to cover up our sad excuse of a mousepad. It literally took me less than 5 minutes + I loved the way it looks. So much better! To make your own, all you need is an old mousepad, scrapbook paper, scissors (or x-acto knife), tacky glue and a pen + or pencil. 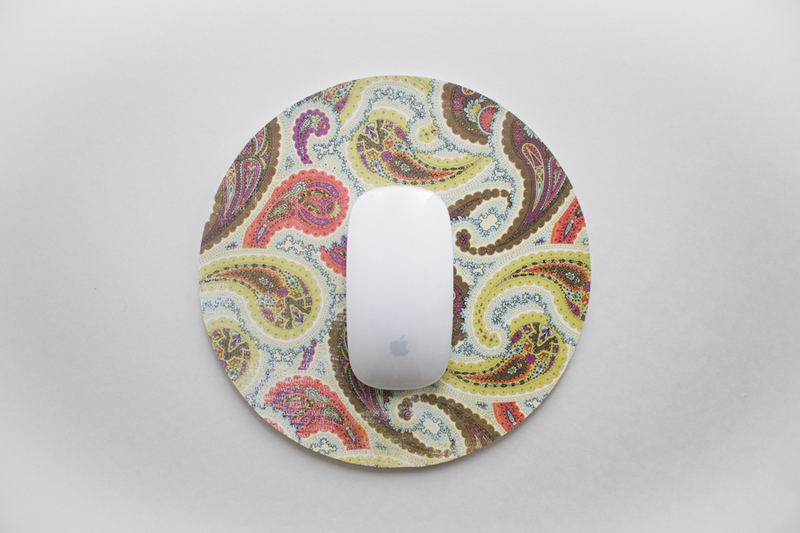 Take the mousepad + pencil and trace a circle (or whatever shape your mousepad is) onto the scrapbook paper. Then cut the shape out, glue it on the pad + you're done! How easy is that? a visit to the plant nursery. Ever since we've hit the warmer months, Joel + I have been dreaming up ideas for our backyard. It's always fun to wander around home improvement stores + find inspiration. For months now, we've driven past a huge plant nursery and we finally decided it was time to make the stop. There were so many pretty flowers, shrubs + my personal favorite, succulents. We didn't purchase anything this go around but we it sure was fun dreaming of what could be. I think our next project is a firepit for the backyard. It's an absolute must for making s'mores on those cool summer nights. What's next on your to do list? As I was planning out how to decorate our little one's nursery, I always found myself admiring these faux deer heads I kept seeing online. The only problem was that they were so expensive. I thought about making my own but didn't have the slightest clue on how to do it. Thankfully, there's Pinterest and a DIY blog called Lil Blue Boo. After reading Ashley's tutorial on how to create your own paper mache animal head, I made a bold move + dived right in. I admit though, that I was a little nervous it would turn out to be a complete disaster seeing as this was my first experience with paper mache BUT with the help of some friends, it came out so much better than I expected + for only $20, I'm pretty much in love with it! So let's get started. Some essential items to have on hand for this project are newspaper & masking tape. Take the newspaper and start crumpling it up in different size balls until it's the shape you need + then wrap it in masking tape. This is how you'll shape the head. This step takes some guesswork + took me several tries until I happy with the general shape of the deer head. Just keep shaping & taping until it looks something like this. I opted out of making a neck for him because it was just more work than I thought necessary (or I'm just lazy) but if that's something you want, just keep using that same process you used for the head. Next, I cut out an oval shape from some cardboard and attached the deer head. Now comes the fun part. Making your paper mache paste. I used 4 cups of water + 1 cup of flour. Bring to a boil and keep stirring until it has a "soup-like" consistency. If the paste seems a little thicker than what you think it should be, that's fine. Just make sure the mixture is smooth and all the flour is dissolved. While the paste is cooling, cut some paper towels in different size pieces. I found that the smaller pieces helped keep things smoother + was easier to apply. Dip the paper towels in the paste, cover the entire head + let dry overnight (or longer if need be) - while the head was drying, I shaped antlers and ears out of cardstock & masking tape. The antlers were a challenge, so I suggest looking at a picture for reference. Once the head is dry, attach the antlers and ears with masking tape and then cover with another batch of paste and paper towels. This time, feel free to go thicker and take your time to shape the head to look exactly how you want. Give the head some definition (again, this is where a picture comes in really handy) This is my deer head after the second layer of paper mache. As you can see, I only added paper mache at the base of the antlers and ears to help stabilize them. Let the head dry for 24 to 48 hours (mine needed two days to completely dry) - once that's done, cut up small pieces from an old book and use mod podge to attach them over the head, cardboard, antlers and ears until it's completely covered (this will take some time) but be patient and keep covering. Once the head was dry, I attached it to a wood plaque I bought at Michael's using industrial glue and then some small wood nails around the edge to secure it. A staple gun is recommended so if you have one, I would HIGHLY suggest using that instead of the wood nails (we accidently put some small dents in our table) - Yeah, lesson learned. I let the glue settle for about a day + then we hung it up on the wall! Here's the finished result! I love it! It's definitely one of my favorite things hanging up in Lincoln's nursery! I'd love to hear if you were brave enough to give this project a try + if it turned out for you! Lincoln's nursery is complete + I must say that it's now my favorite room! I really just want to relax in the rocking chair, prop my feet up & read books to the little guy currently taking up residence in my belly. I wanted to keep Lincoln's nursery simple but still fun by adding a few unique pieces to his room. One of the things I REALLY wanted was a faux deer head for the wall but they can be super-duper expensive so I braved the world of paper mache + made my own (click here for tutorial) - but anyways, I love how happy this space is. New mommies, how did decorating your little one's nursery turn out? Was it hard to bring your vision to life?